Hemp foods have always had a huge potential, but six years ago it looked like there was not going to be a hemp foods market in the United States. Because of the hard work from many people hemp foods remained legal. Building up the processing infrastructure and educating the marketplace is slowly paying big dividends. As of October 16th the Health Canada Industrial Hemp Statistics 2006 show that 20,554 hectares (50,768 acres) of hemp were licensed this year. Many new products have been created with all of this hemp. One of the things that many people, me included, have longed for is hemp milk. The wait is just about over. 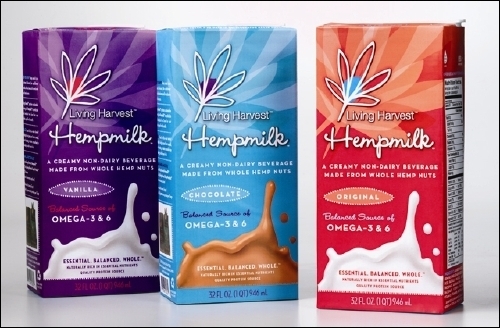 Slated to be introduced in January of 2007 Living Harvest Hempmilk will be one of the first hemp milks on the market. I was lucky enough to get advance samples to to try. My favourite is the Chocolate. I just finished a glass of Cafe Altura Peruvian Fair Trade Dark Roast coffee with Living Harvest Hempmilk Chocolate instead of my regular organic raw milk. What a wonderful flavor combination! My kids really like the Chocolate flavor, too. The Vanilla has a great mouthfeel and flavor without being too sweet. The Original has just the right balance of texture and flavor without being beany like soy milk or watery like rice milk. Both of the latter flavors are excellent on cereal and are wonderful on our Crunchy Granola and Special Oatmeal. 2007 looks like it will be a great year for hemp foods! I was able to get a sneak peek at this product and find the hemp milk absolutely fantastic and much better than soymilk! Chocolate is my favorite, either cold or warmed up and served as "hot chocolate".